Snoop Dogg, a rich guy who likes to smoke weed, has unveiled a new line of bongs for other rich guys who like to smoke weed. Named POUNDS, presumably after the quantities in which its expected clientele purchases weed, because they are rich, this collaborative collection from Famous Brandz was reportedly “inspired by Snoop’s own vision.” In Snoop’s literal pipe dream, he dared to imagine smoking his marijuana out of a very expensive bong. This fanciful reverie then became reality in the form of five separate handblown glass models resembling Star Wars droids who were created expressly for the purpose of sitting on Snoop Dogg’s coffee table and watching The Avenging Disco Godfather on repeat. 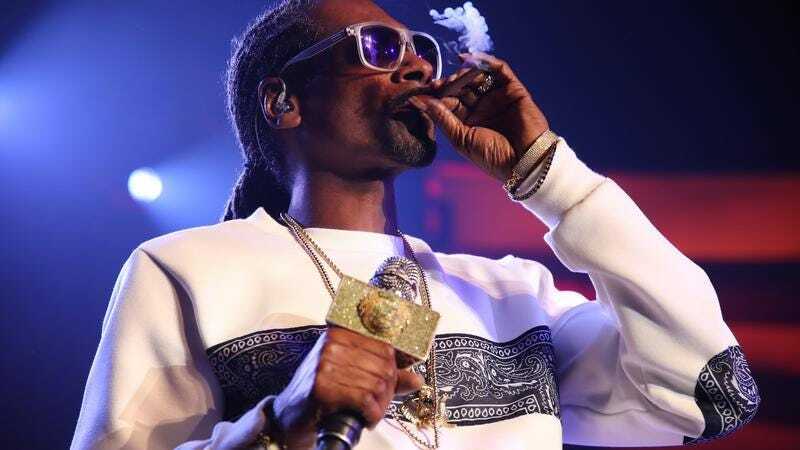 Snoop then had the foresight to charge between $129 and $279 apiece. And lo, Snoop Dogg’s vision did come to pass. Dubbed Battleship, Mothership, Rocketship, Spaceship, and Starship—after the fact that you can get stoned and smash them into each other making fake laser sounds, because you’re rich and who cares—the five POUNDS bongs each boast different special features like ice catchers, down-stem diffusers, and “triple-stacked honeycomb and turbine percolators” that you can drone on about while your guests wait for you to pass it already. But no, you won’t pass it yet. You’re a rich guy who’s really into weed, and you need them to know that. You shelled out nearly $300 for a fancy Snoop Dogg spaceman bong, so they’re damn well going to sit there while you explain why you opted for the inline ruffle percolator and bubble dome to use expressly with extracts, but that you prefer the barrel percolator for dry herbs because of the robustness of the clouds it produces. If they just want to “smoke weed” like a gutter rat, they can go home and make a pipe out of a crushed-up Budweiser. Ha ha, rich guys. Ridiculous! Anyway, I keep weighing whether to buy one of those $250 vaporizer bongs because I’m a giant hypocrite. Should I do it? I think I should do it.